Declaration of the Ukrainian Greek-Catholic Church regarding the violence against Rom (Gypsy) Camps in various regions of Ukraine The news of ever increasing violence in certain parts of Ukraine has caused me great concern and indignation. Recently a great tragedy occurred, which resulted in the death of one person and the injury of numerous others, including women and children. 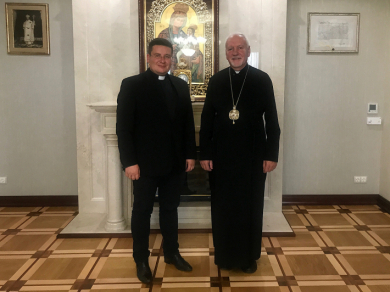 Vice Rector of UCU Oleh Turii received state award of Vatican Vice Rector for External Affairs of UCU, Director of Church History Institute, Oleh Turii, Ph.D, was awarded the Cross for the Church and Pontiff. This is the highest award, which lay person can receive in the Catholic Church. St. Anne Ukrainian Catholic Church in Austintown, OH (USA) Held Its Annual Ukrainian Festival On September 24, 2017, St. Anne Ukrainian Catholic Church in Austintown, OH, a parish of the Ukrainian Catholic Eparchy of St. Josaphat in Parma, held its annual Ukrainian Festival. Statement of Metropolitan-Archbishop Stefan Soroka on the Suffering and Hardships as a Result of Hurricane Harvey and its Aftermath Metropolitan Stefan Soroka, together with Bishop John Bura and Bishop Andriy Rabiy, clergy, religious and faithful, pray for those suffering as a result of the damage and flooding caused by Hurricane Harvey, especially in Texas and Louisiana. Pope Francis pays final respects to Cardinal Husar In a heartfelt personal letter, Pope Francis has expressed his desire to “be among those praying to the heavenly Father” for the “chosen soul of our Brother” Cardinal Lubomyr Husar.